US$ 1495 / person ? 3 Wangdue – Trongsa Visit of Punakha dzong, which counts as the most intricately decorated castle in the kingdom. Short walk to Chhimmy lhakhang temple, devoted to 15th century saint Drukpa Kunley, know as “Divine madman”, who did taught Buddhism by singing, drinking and rampant sexual behavior. If time permits, also visit Sangchhen Dorji Lhuendrup Lhakhang nunnery with Bhutanese and Nepali style stupa, overlooking the valley from the high hill. Drive to Trongsa over Pele-la pass (3550m) with stop at Chendebji stupa, built after the Boudhanath stupa of Kathmandu. Reaching hotel by evening. 4 Trongsa – Jakar Visit the great Trongsa dzong, the castle from which the royal dynasty of Bhutan has risen. Intricate museum in watchtower Ta Dzong hosts number of interesting artifacts related to royal dynasty, history of Bhutan and many religious statues and temples. Drive to Jakar over Yotong-la pass (3550 m). Visit of Red Panda brewery or other sight, if time permits. 5 Jakar Visit of sleepy castle Jakar dzong and old Jambay lhakhang temple, which pins down the leg of giant demoness. Walk to Kurjey lhakhang temple complex. After exploring the place, enjoy the picnic lunch on beautiful riverside. Finally continue walk to Tamshing Gompa, the temple where you can wipe your sins by carrying the chain-bar smithed by 15th century blackmisth-saint Pema Lingpa. Explore the town with it’s interesting curio shops and welcoming local restaurants. 6 Jakar – Paro (by flight) Taking domestic flight to Paro is extraordinary experience. You will see many of the seven and six thousand meters high mountains on the border with Tibet, including Gangkhar Punesum which counts as the highest mountain never summited by men. After landing in Paro, visit National museum and Paro dzong, castle where Bernardo Bertolucci’s Little Buddha film was shot. Explore the lively small town. 7 Paro Drive to castle-ruins of Drukyel dzong, from where you can see the top of holy Jomolhari mountain. 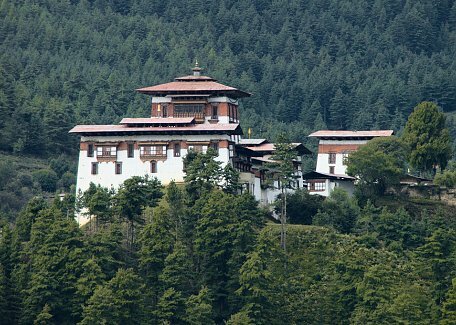 Explore the calm Kyichu lhakhang which also pins down giant demoness body. Climb to Taktsang gomba (Tiger’s Nest), is the highlight of the tour. While the hike seems to be hard, it’s very rewarding. If you don’t feel so strong, you can climb just halfway to cafeteria with nice view of the place. You can consider hiking in the morning or early afternoon depending on weather, your fitness and preferences. 8 Departure If time permits, you can make visit to Dzongdrakha gompa, the temple built below the rocky cliff which beauty is only rivalled by Tiger's Nest. Perfect place to give Bhutan good bye! After that you depart from Paro by flight or take 6 hours drive to land border in Phuntsholing. Include pristine Phobjikha valley (+1 day): Add one more day to stop in pristine Phobjikha valley in between Trongsa and Wangdue. See details in Historical Heart of Bhutan I, 9 days program. Reach to Tang valley in Bumthang (+2 days): Visit Phobjikha as above and also spend more time in beautiful Bumthang and visit Tang with interesting museum in old aristocratic palace. See details in Historical Heart of Bhutan II, 10 days program.